I completed this layout for free, completely nothing. It was so fun to create it and play on my favourite online scrapbooking program. 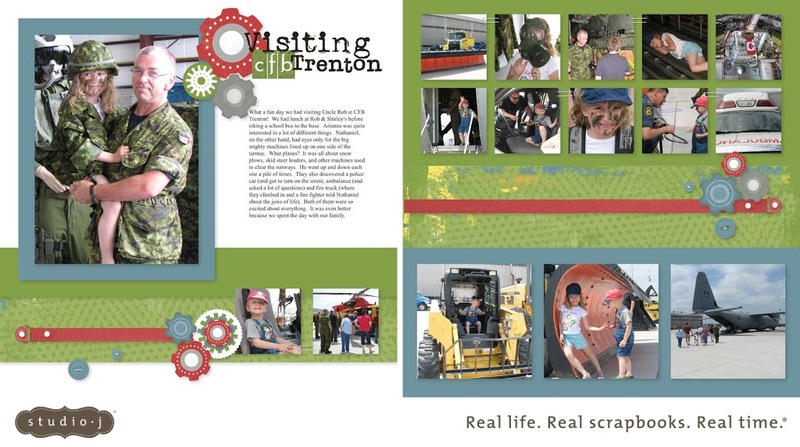 We visited Uncle Rob at the Canadian Forces Base in Trenton on June 5 and I’ve already got this very fun event scrapbooked. I love how quickly I was able to finish it. You’ve got a few days left to make your free layout. After it’s complete, you can print it the same way you would do your photos for your classic layouts. Just visit my website and start getting caught up or even just create a layout to celebrate a recent event. Very nice layout, love the distressing and all the war paint the kids are wearing.